Two of Northern Ireland’s top young scientists will be jetting off to South Korea this summer to take part in the International Biology Olympiad 2010. Liam O’Reilly from Christian Brothers’ Secondary School, Belfast and Emma O’Deorain from St Cecilia’s College, Derry won first place in the first ever Northern Ireland Biology Olympiad which was hosted at the University of Ulster’s Coleraine campus today. They will join team mates from the Republic of Ireland to compete against secondary school students from over 70 countries worldwide in the prestigious event. Liam and Emma fought off stiff competition to secure their place in South Korean final with almost 500 school pupils taking part in the first round which was held at Ulster in December 2009. Today 60 students battled it out in a bid to win the coveted places, taking part in a range of practical experiments and written assessments. The International Biology Olympiad takes place annually and is designed to inspire young, gifted students to pursue a career in biology. The competition brings students from all over the world together to develop their skills in tacking specific biological problems. The Olympiad also offer the opportunity to compare the syllabuses and educational trends in biology in different countries and helps improve biology education on an international level. 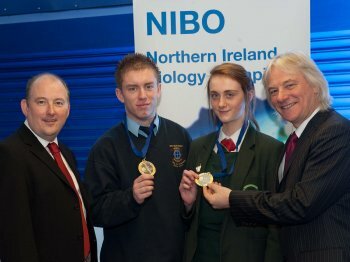 The Northern Ireland Biology Olympiad is supported by the Department for Education.